Border tower protecting the fortress (Castro) of Sanoudos in Chora, Naxos. The wall surrounding the fortress is pentagonal and has three gates. The Glezos tower (Krispi) stands near the northwestern gate and extends in part along the western and northern side of the fortress (Castro). It has four levels (floors) and it is the only tower in Naxos that has also a round tower attached to it. In 1207 Frankish rule was established in the Aegean. The Venetian Markos II Sanoudos built the fortress of Chora in Naxos with circuit towers, one of which, the Glezos tower (Crispi) is still preserved. Over the main entrance to the tower is the coat-of arms of the Crispi family. The tower has been given by Mr. Petros Glezos to the Archaeological Service, which plans to use it as a museum. When the necessary work has been finished, this will be the first Byzantine Museum in the Cyclades. In 1968-1969 the Glezos tower was restored. In 1968 the tower was stabilized both inside and out, and the wall construction reinforced. 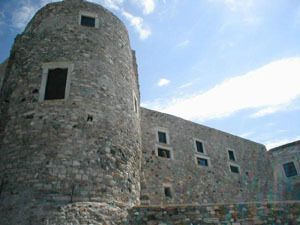 In 1995 work was begun on restoring the tower to serve as a museum. Name of the monument: The Fortress (Castro) of Chora, Naxos, and the Glezos Tower (Crispi).